Artists can create all sorts of patterns in paint with these durable and easy-to-clean foam rollers. They feature distinctive patterns that young artists are sure to love. The easy-to-grasp handles have handy loops for storage when not in use. 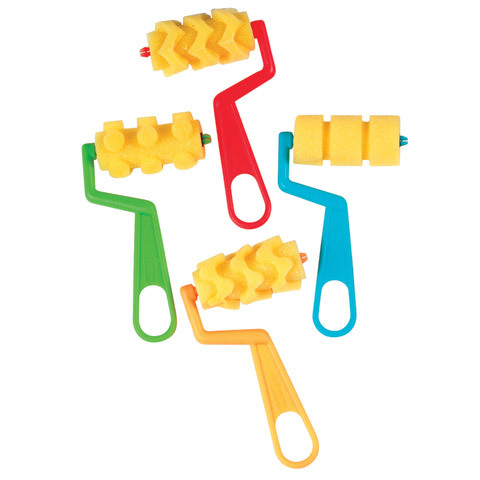 The 3-Pack Set contains a plain roller, a patterned roller brush and a thick, flat foam brush. The 4-Pack Sets contain four patterned foam rollers. The patterns in set CE5170 include zig-zags, waves, dots and stripes. The patterns in set CE5171 include wide stripe, checkerboard flowers and hearts.